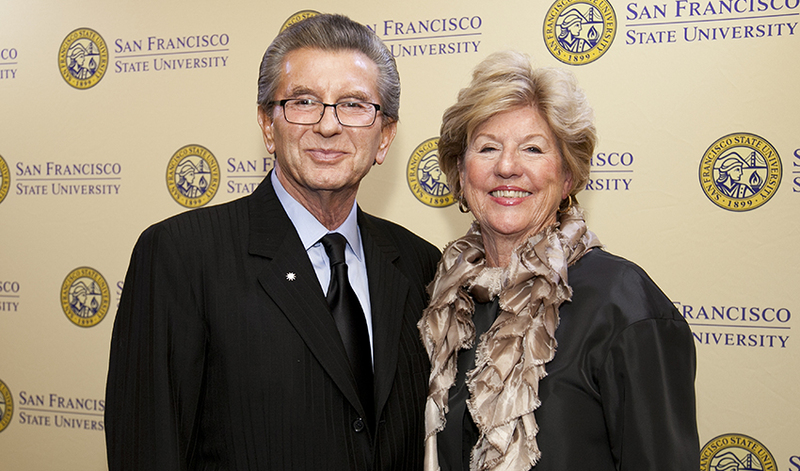 San Francisco State University President Leslie E. Wong today announced a $25 million gift from alumni George and Judy Marcus — the George and Judy Marcus Funds for Excellence in the Liberal Arts. This gift, combined with a recent $1.8 million Athletics scholarship fund gift from the couple, represents the largest donation — $26.8 million — in the history of San Francisco State. George M. Marcus is a first-generation American. He is the co-founder of Marcus & Millichap Company and has been its co-chairman since 1971. Marcus & Millichap is the parent company of a diversified group of real estate, service, investment and development firms. He is a trustee emeritus of the CSU Board of Trustees, serving from 1981 to 1989, and is a current member of the CSU Foundation’s Board of Governors. In 2012 he concluded a 12-year appointment as a regent of the University of California. "San Francisco State helped define our future and it is our hope that this gift will do the same for students and faculty in the College of Liberal and Creative Arts now and for many years to come,” said Judy Marcus.